meeting at the Grand Hotel in Manchester on 3 April 1914 (Arden and Lockett 1914). It was of high importance that the glass bottles filled with 2.27 L of sewage were protected from light for the first time, so that algae could not grow. They filled their bottle with sewage from the Sewage Works at Davyhulme. If the sludge had a volume of 25% after sedimentation, "carbonaceous fermentation" and nitrification could be completed to a high degree within 24 h. It was very important that the sludge was mixed with the sewage and that sufficient air was added. The pH must be controlled by adding a small quantity of alkali. These published results are presented in Fig. 1.13. In this figure, concentrations are given in "parts per million", which means approximately 200/106 = 200 mg L-1. The organics were measured as "Oxygen Abs.". The authors probably used KMnO4 as an oxidizing agent. 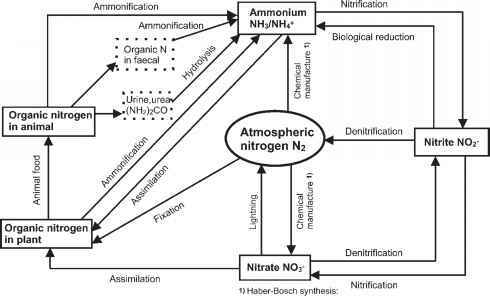 The nitrification rate was slow compared to the removal rate for organics over the first 8 h. After this time, the situation changed. Fig. 1.13 First batch sewage aeration experiment with enriched activated sludge (Arden and Lockett 1914). h in sufficient oxygen transfer and mixing of the water and sludge (Bolton 1921; Imhoff 1979). In Germany, the first large plants were built in Essen-Rellinghausen in 1926 (Kuhn 1927) and in Stahnsdorf near Berlin in 1929-1931 (Langbein 1930), the latter of which was designed and operated as an experimental plant for the study of different sedimentation tank designs (Mohajeri 2002).